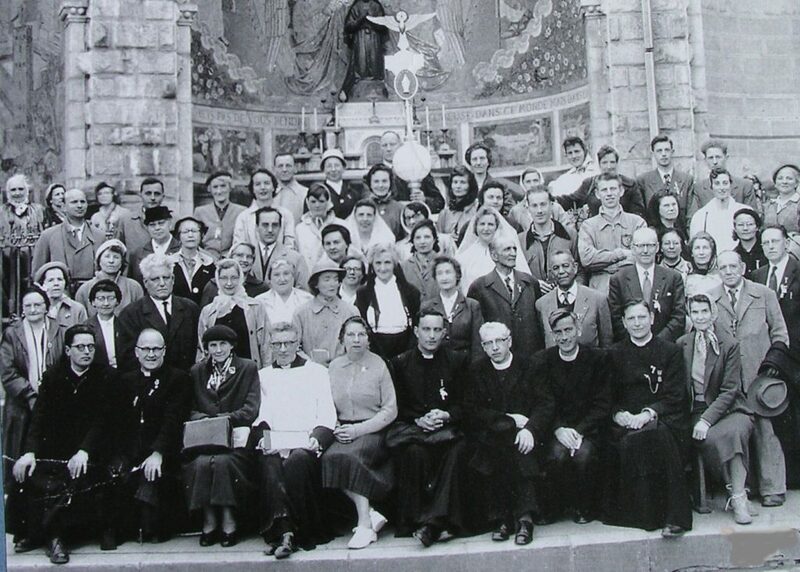 However, in 1948, in the diocese of Lourdes, fief of the Blessed Virgin, the Legion of Mary was still not founded. Happily, Saint Bernadette had taken the Legion of Mary under her wing and she guided Miss O’Brien perfectly naturally to Lourdes where the first group was formed, thanks to Mr. Abadie from the Hotel St Jean, a second at the St Roch boarding house, with the help of Miss Bourreau and Mrs. Cassel, a converted Jew, the spiritual director being Father Lelaure. The existence of these groups was rapidly made known; the movement being international, the Legion of Mary already existed in several countries and legionaries pilgrims flowed. The National Council then envisaged the creation of a permanent centre in Lourdes. Through the intermediary of Mgr Mericq, Lourdes parish priest, a parish hall on rue de Bagnères was placed at the disposal of the legionaries (they shared it with other movements, including the A.C.G.F.). During the summer of 1953 the centre was open for two hours a day before the Blessed Sacrament Procession and cared for by four legionaries from other areas. They took it in turns, giving a part of their holidays in the service of Our Lady. The Lourdes Legionaries themselves paid a moderate sum towards their lodgings on route de Pau, and for their meals on Avenue Peyramale. All these long comings and goings, including the “library on wheels” from rue Bagnères to the Shrine, made those concerned very tired although all these constraints were accepted with a great deal of self-service. At the same time, legionary pilgrims complained of not being able to make contact with the centre because of their lack of time and the centre being too far from the Shrine. Therefore, the only solution was to find a more accessible place for the Legion of Mary, and more convenient for everybody. With this purpose in mind, many steps were undertaken, but in vain. But without being discouraged, the legionaries attempted what the Legion of Mary calls “the symbolic action”, that is to say,a step forward in the spirit of faith, even if humanly the thing did not seem possible, but knowing that nothing is impossible for God. In this spirit, it was decided to take a step towards Mgr Théas. He was very kind but could not help us. Still without a response, the search continued. Then Providence led us to Mr and Mrs Lanoë, the latter being the sister of Mrs Colomer, who had some land with a house. To our great surprise, some time later, Mrs Colomer-Soubirous let us know that she would like to offer the Legion of Mary the land and house. This gift from Our Lady of Lourdes, through Mrs Colomer’s bounty, was truly wonderful. Immediately, works were accomplished to again access to the property, and a little wooden bridge placed across the canal. Grateful and very enthusiastic, the legionaries took immediate possession of the house, to get down to the cleaning and summary renovation for the 3 months during the Summer of 1956: partitioning, painting, converting the reception area and some small bedrooms were the only improvements envisaged. 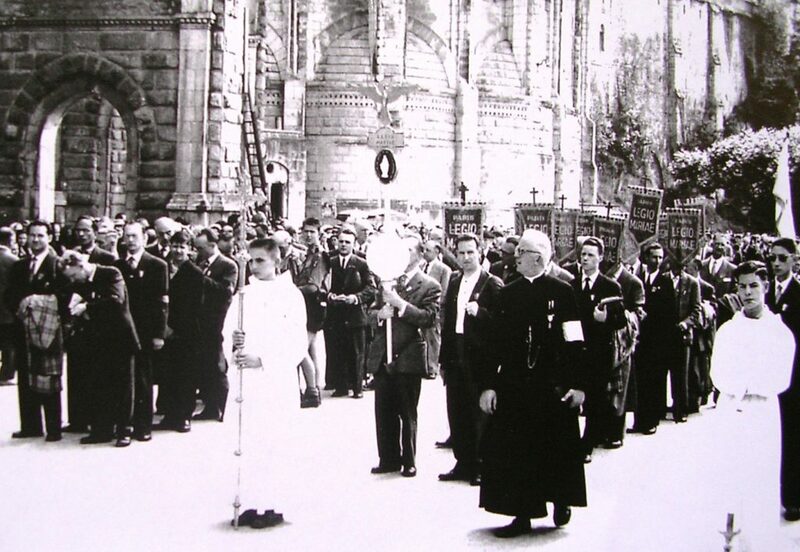 The whole was achieved very quickly, and the inauguration took place in July 1956, in the presence of five bishops, including Mgr Théas and Mgr Suenens, on the occasion of the first Belgian legionary pilgrimage. Every year, the number of permanent staff grew. From four pioneers in the Summer 1953 to thirteen French legionaries in 1954. 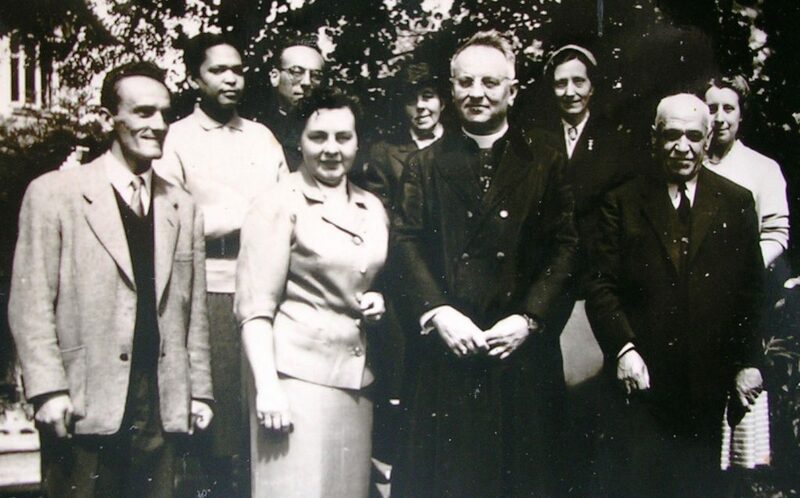 In 1955, there were nineteen team workers, including two Belgians, two seminarists, and three priests. Already, the necessity to enlarge the premises was becoming evident. The small, ground-floor room was shown very quickly to be too small to welcome the 40 to 50 pilgrims in the evening, some of whom, standing on the covered part of the canal, could only participate in meetings from the outside. On the other hand, the centre obtained an apostolic and Marian formation for legionaries, that could only be realized within a united team. Nothing yet allowed for the lodging of male legionaries who, each evening, had to return to their rooms far from the house. Therefore, it was necessary to build. From the end of the 1956 season, plans and estimates were drawn up. Mr Soulas, an entrepreneur, oversaw the construction, helped by Mr Martial, an architect, director of the Fine Arts College in Liege, he himself a former co-worker. We owe the decoration of some of the rooms to his fine-art pupils. As to the financial plan, the Legion of Mary, having neither goods nor a bank-account, rested solely on the generosity of the French, Belgian and Swiss legionaries and the help of Providence. In 1958, the year of the centenary of the apparitions, the extensions were complete. Already, during this year, the centre’s visitor’s book recounts the passing through of celebrated visitors: Father Mc Grath, imprisoned after a heroic resistance and expelled from China, and Cardinal Tisserant, Legate of the Pope at the Marian Congress of September 1958. In spite of the practical works, apostolic life was organised: a welcome at the centre, camping, visits confided to our care by Mgr Théas. The “library on wheels” allowed for contact after the Blessed Sacrament Procession. Then came the idea to make a way of the cross; it took place every Friday. A meditation was prepared for each station. Beginning at the first station with 10 or 12 people, it ended in descending with 150 or 200 people. Many asked questions about Lourdes and where the idea came from for the afternoon meeting to talk about the Lourdes message. Faced with this growth, the initiative was continued by Father Lelaure of the Lourdes Legion of Mary, helped by a team of legionaries from Paris, and with the help of the A.C.G.F. Also faced with the growth of the number of lone pilgrims, the Shrine took charge of the organisation. We had joined in what has become, with Father Point, the one-day pilgrimage. What a long way to progress from December 1955, when we received with gratitude this gift from the blessed Virgin. With her help, we have been able to this day to ensure our permanent presence from May to October, not without problems sometimes, I have to confess. Therefore we are here today to give our thanks to Our Lady, and to thank her for having been so visibly close to us. Our thanks also go to all those who helped us at the beginning of this “adventure”: Mgr Théas, Mrs Colomer-Soubirous, the Lanoë family, Veronica O’Brien and so many others, without forgetting the first Lourdes legionaries and the all the French and Belgian pioneers during this heroic period. Thank you to all legionaries of all races and nationalities, who for 60 years have worked voluntarily, in turn, in the service of Our Lady and their brothers and sisters.